When searching for a new turntable, today’s consumers face hundreds of choices. Modern turntables seem to have an endless number of features, and it can be overwhelming trying to find the one that matches all your needs. A belt drive turntable can be perfect for some vinyl enthusiasts, as they have an independent motor that drives the platter with a large rubber band. This type of turntable may not be appropriate for the consumer who is looking to become a DJ, but for people just wanting to listen to records, a belt record player is perfect. They are known to have higher sound quality because they produce less outside noise and vibration. To ensure that you get the highest quality sound possible it is essential that your new belt record player is set up correctly. The first step of setting up your new belt record player is picking the perfect place for it to go. To make sure the record plays correctly, it is best to choose a stable and level surface. A good record player stand will do wonders. Some turntables will have adjustable feet that allow the listener to adjust the level. It is also important to think about where the speakers go also. If the speakers are small, it won’t matter if the player is next to them or even put between the speakers. However, if the speakers are large or produce a lot of bass, it is best that they are set away from the turntable. Not all belts are made the same, and it is essential that the correct one is used to ensure your vinyl sounds crisp and clean. Width, length, and thickness all affect how a belt fits inside the turntable and how the record is played. Next, carefully wrap the belt around the motor to ensure that it fits correctly. Als remember to make belt straight and not twisted. Some turntables have a motor that sits on the outside while others lie under the platter. It will be apparent where the motor is located on each turntable, but where the motor sits will determine how the belt is installed. If on the outside, install the outlet platter before you install the belt. If under the platter, there will usually be two spots for the belt to be wrapped around. Wrap the belt around the top spot, as the bottom is meant for 45 RPM records. The belt will self-center when you give the platter a gentle spin. The tonearm is the light balanced arm that holds the pickup cartridge. 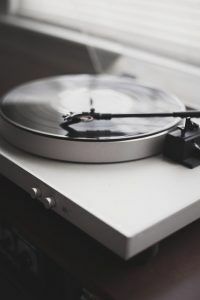 Most turntables will come with a pre-fitted tonearm, but it is possible to get a new one, and specialty decks may require it. To make sure the cartridge sits in the grove correctly a tone arm’s height must be set, so the arm is parallel to the record’s surface. It is possible to change the arm bearing to make it slightly higher or lower, altering the angle at which the stylus tip touches the groove. However, when first setting up, it is easiest to start with a level tonearm. At the rear of the tonearm, there will be a counter-weight that can be adjusted to change the downforce on the turntable. It is best to set the weight and downforce to the manufacturer’s recommendations. If there is not enough weight the cartridge won’t be able to track the groove accurately and the sound will become thin. If there is too much weight, the sound will become bland and dull. Bias is the sideways force on the cartridge to balance the inward pull of the record groove. It is essential to set the right bias, and it is usually the same as the tracking weight. Even minor changes and adjustments with the bias will make a big difference. The tiniest error in alignment can cause massive distortion. Take the time to set the weight correctly, and you’ll have your record player working at its best. Dirt will destroy a good vinyl. Dirt usually shows up on both the record and the stylus tip. For regular use, a stylus cleaner with a good brush can remove dirt without damaging the record. There are also stylus cleaning fluids that can occasionally be used but aren’t needed every day. A clean record is the best sounding record. After about five years it is best to replace the belt. If possible, it is best to find an identical belt, but there are other options as well. Do research and find a belt that matches the measurements of the old belt. The belt will still stretch out even if the turntable isn’t is often used. If there are no plans to use the turntable for an extended period, you can remove the belt to extend the belt’s lifetime. Proper maintenance and cleaning will ensure that you can enjoy your turntable for years to come. Next Post How Much Is A Prince Purple Rain Record Worth?